Our UK events have concluded for 2018.We have had an amazing season and we are looking forward to our 2019 season happening in Naples, Italy. Details will follow in this regard, thank you all for your support on our amazing journey so far. The Qualifier will offer swimmers with the choice of three events. These events will be an opportunity to do what it says on the tin (subject to temperature) undertake a ratified qualification swim that will serve as an English Channel Qualifying swim. We expect the temperature to be around 13-14c, regardless of the realised temperature of the water on the day the event will be going ahead. Of course if the water temperature is above 15.5c then the swim cannot be used for qualification but for training only. If the water temperature is significantly lower than our anticipated 13-14c some swimmers may well wish to reconsider their 6 or 2 hour attempts. In order to support swimmers at the event we will have a full water safety and dry land event crew. We request that you bring a member of dry land crew with you to prepare your feeds. However, water based crew are not required. Rewarming facilities and catering are both available on site. Please note that this event will be a continuous swim with deep water feeds. If you need to leave the water then your event will conclude at that point. 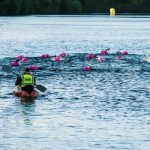 The event will be held in fresh water at Activities Away Lincoln, the same lake that provides you with crystal clear water for the 100% Swimming – 12 / 24 hour endurance swim challenges. In keeping with our community approach these events will be available to all. They are open to skins and wetsuit swimmers alike. Hang on we hear you cry! Yes yes, we know, if you are in a wetsuit its not a qualifier. No problem with that – we agree but we are welcoming to all and it gives those who are starting out on their endurance swimming journeys an opportunity in a safe and supportive environment to have a go at endurance for the first time. Indeed there may not be many swimmers who wish to use this as an actual opportunity to “Q” but simply just for training instead. Heck its a great opportunity to come and have a really long swim in a safe and supportive environment. In the evening we will provide a short night swim (2 hours) on a limited circuit to provide you with the experience of swimming at night. Once again this is available to non wetsuit and wetsuit swimmers. If feeling comfortable with swimming at night is something that you want to get to grips with then this is the one for you! This event is designed to boost your confidence whilst providing you with an opportunity to learn the skills required to swim at night. 100% Swimming and Activities Away are pleased to announce a unique marathon open water swimming challenge. To complete this 24 hour marathon open water swimming event you will need to swim one mile on the hour every hour for twenty four hours. This challenge can be undertaken as an individual, as a pair (alternating swimmers each hour) or as a team of three people (rotating swimmers each hour). Swimmers must be age 18+. The first mile of our epic challenge will commence at 19:00 on Thursday 21 June 2018 and the final mile must be completed by 19:00 on Friday 22 June 2018. Please do not underestimate the magnitude of this challenge. You must be very competent and experienced in open water swimming, night swimming, cold water management and endurance events. Applications will be considered in light of your experience; if you require guidance as to which category you may be most suitable for (Solo, Pair or Team) we are happy to have a chat with you in advance of applying. This event will be led and overseen by Paul Fowler – Founder & Head Coach of 100% Swimming and Steve Poulton – Founder & Owner of Activities Away. You are in safe and knowledgeable hands; in 2014 Paul (founder of this event) went on to become just one of four solo swimmers to complete the challenge. Steve was on site throughout the event to manage site operations. Additionally both have excellent safety and management records across a wide range of other events spanning over 25 years. Last years event (2017) took place with an average water temperature of 21c. We welcomed 19 entrants to the start line* (37 people – comprising solos, pairs and teams) and witnessed more solos than ever complete the challenge and a full compliment of pairs and teams complete also. Our furthest athletes have travelled from the USA and Australia! We put the high level of success of participants down to great planning and training on the part of the swimmers and excellent delivery on the part of our event volunteers. If you would like to be a part of our 24 hour event in 2018 then we look forward to hearing from you. Please note should total valid applications (swimmers with relevant experience) exceed our maximum number of places available then places will be allocated by random ballot NOT on a first come first served basis. 100% Swimming and Activities Away are pleased to announce a unique marathon open water swimming challenge. To complete this 12 hour marathon open water swimming event you will need to swim one mile on the hour every hour for twelve hours. This challenge can be undertaken as an individual, as a pair (alternating swimmers each hour). Swimmers must be age 18+. The first mile of our epic challenge will commence at 20:00 on Saturday 26th May and the final mile must be completed by 08:00 on Sunday 27th May 2018. Please do not underestimate the magnitude of this challenge. This is not “little brother” to the 24 hour swim – this is a serious undertaking. Being earlier in the season the water temperature will be colder and virtually your entire swim takes place at night. You must be very competent and experienced in open water swimming, night swimming, cold water management and endurance events. Applications will be considered in light of your experience; if you require guidance as to which category you may be most suitable for (Solo or Pair) we are happy to have a chat with you in advance of applying. Last years event (2017) took place with an average water temperature of 19.0c. (15c in 2016) We welcomed 18 entrants to the start line (21 people – comprising solos & pairs) and witnessed a very high success rate as all but six solo swimmers completed their 12 hour challenge. We put this down to great planning and training on the part of our swimmers and excellent event delivery on the part of our event volunteer team. If you would like to be a part of our 12 hour event in 2018 then we look forward to hearing from you. Please note should total valid applications (swimmers with relevant experience) exceed our maximum number of places available then places will be allocated by random ballot NOT on a first come first served basis.